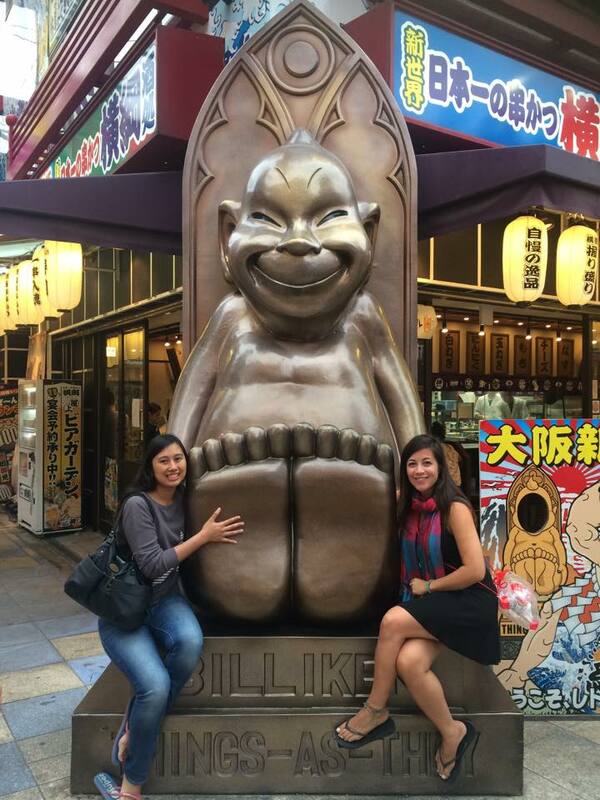 Osaka and the ideal place to go on a first date – Where's Walton? During the mid point of my travels I set myself a challenge that would lead to a treat. If I was good with money, budgeted, didn’t waste my money on items that would make bag even heavier – I would extend my trip a little further and go to Japan. I had visions of red temples, cherry blossoms, ramen noodles, strange themed cafes, harajuku girls, Geisha’s and clean streets. I needed to see this place! When it came to two months left of my trip, the budget was looking a bit sad but I had plenty funds saved to keep travelling. So booked a one-way flight to Osaka and a flight home from Tokyo to the UK. 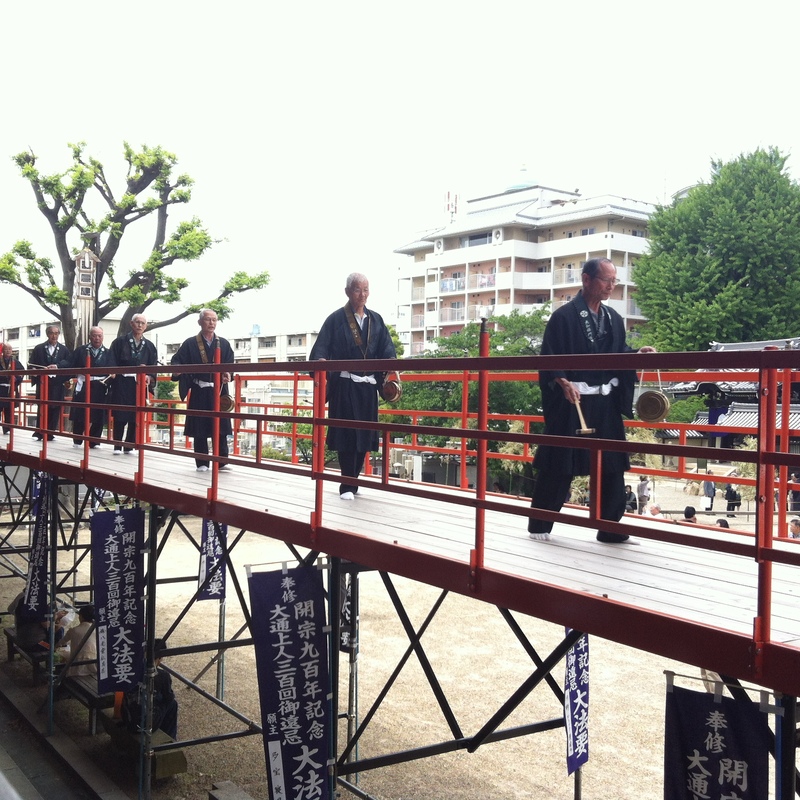 The plan was simple, 10 nights and 3 cities: Osaka, Kyoto and Toyko. It was a shorter trip than I would have liked, but (at the time) I was even fine with the idea because I finally felt ready to finally go home. 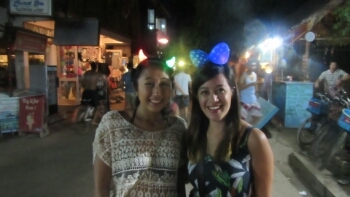 In Osaka I was kindly invited to stay two nights with Tisya, a girl I met on Gili T over New Years! 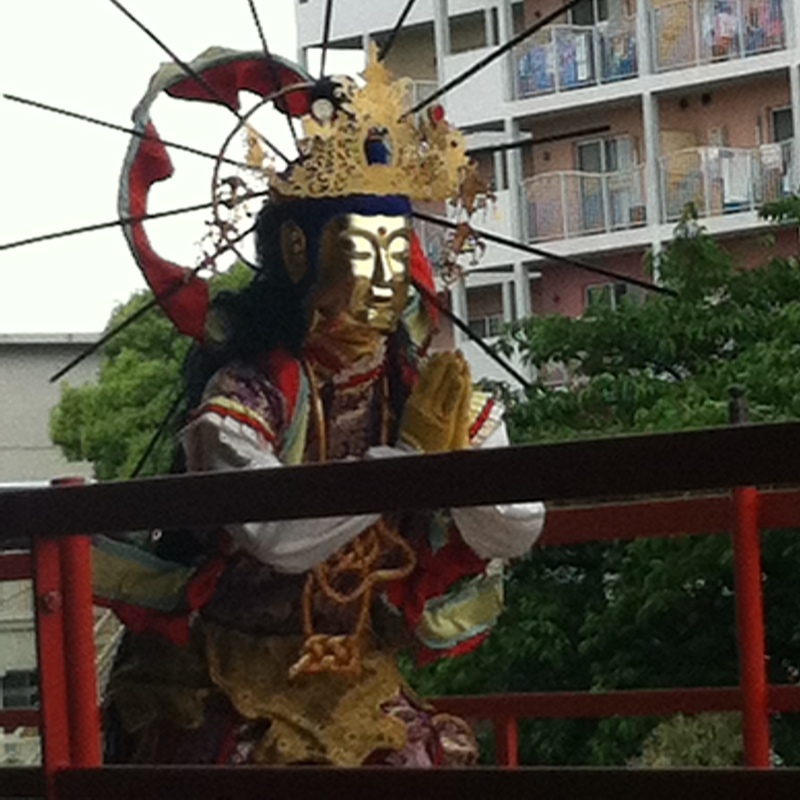 There was an annual holiday taking place in Japan at this time and all hostels were booked up. So I was really grateful that she opened up her appartment to me. 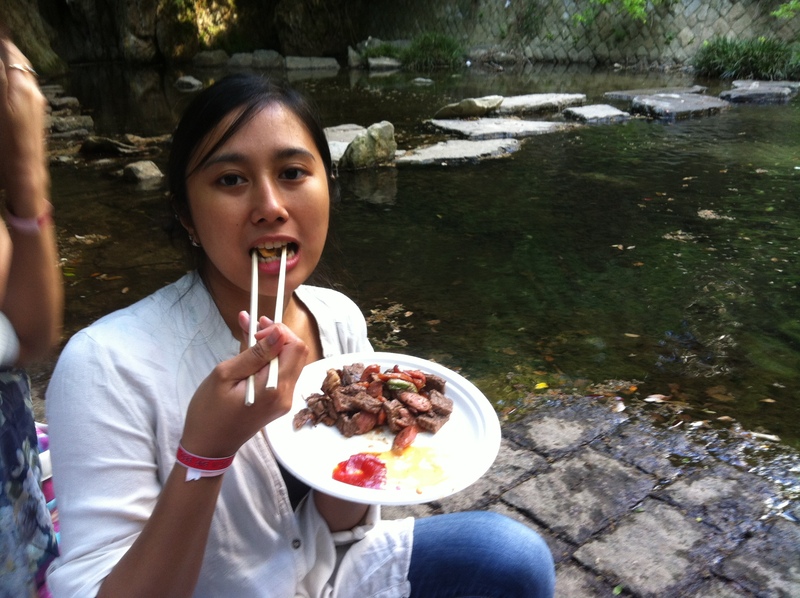 Tisya is from Jakarta in Indonesia, but now lives in Japan – she speaks fluent English and Japanese and lives in Osaka. 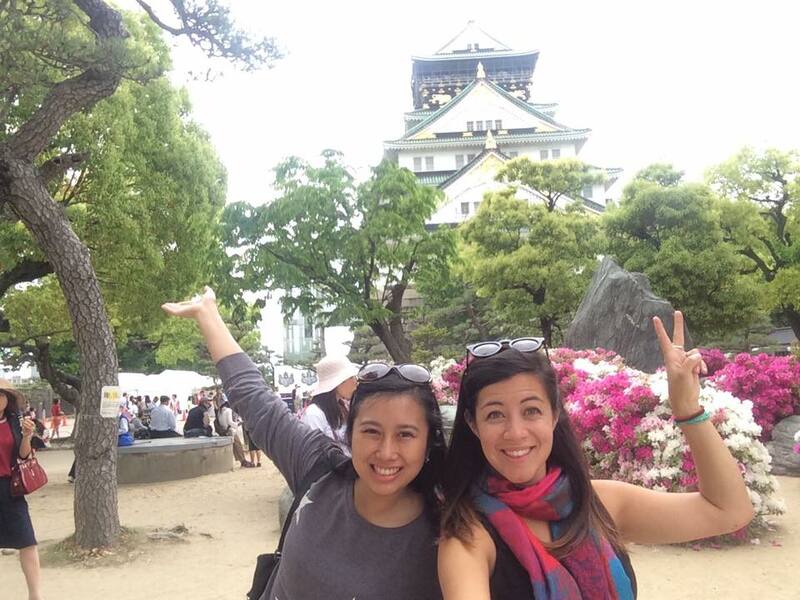 She had told me so many wonderful things about Osaka that I couldn’t visit Japan without seeing her. At the point of sitting down on the train and started to do some people watching to get a feel for Japan. Almost immediately it became very apparent that I was extremely UNDER dressed. The women here are dressed to perfection from the top of their heads down to their toes. They really do take pride in the way they look, the make-up, the hair and even the socks they wear are picked out especially to match the outfit. The following day Tisya had a long list of fun things for us to do in the city. We started the day off with a traditional Japanese breakfast that Tisya had kindly made then we set off into the city. 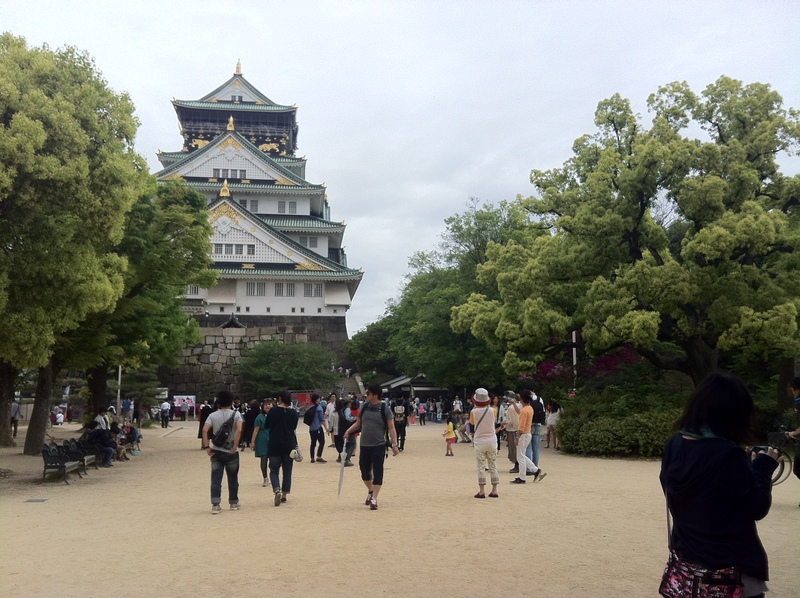 First stop, Osaka Castle. The first question on my mind when arriving here was, where is all the cherry blossom?? Turns out cherry blossom only bloom for 2 weeks out of the year and I was a month late. DOH! Note to self: DO RESEARCH!!! 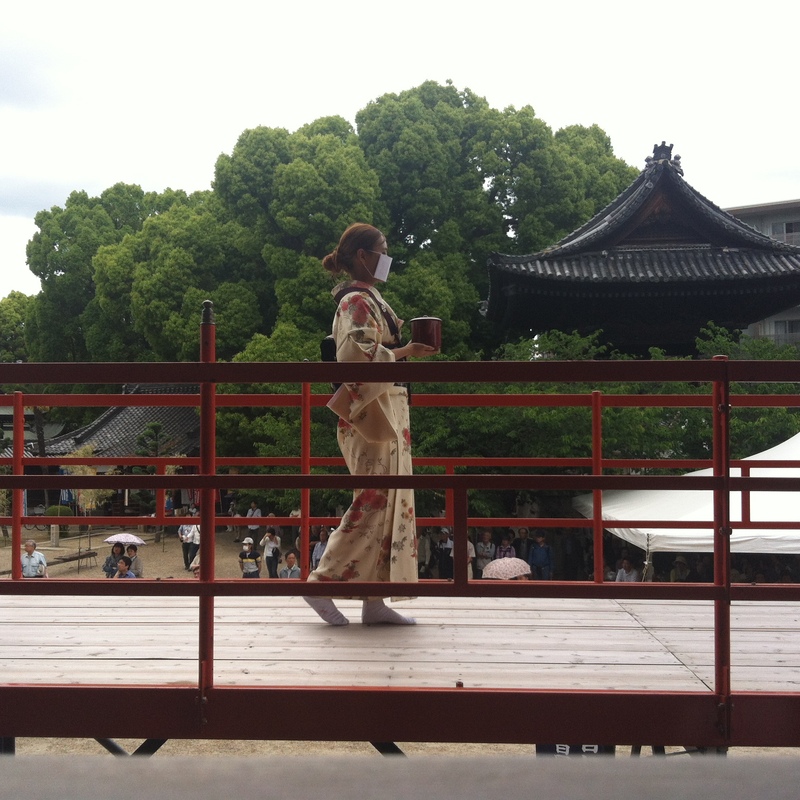 We then went to a festival in town, I’m not sure what it celebrating was but basically we watched a show of masked warriors and local people in traditional clothing playing instruments walk down a runway. Around this show was lots of market stalls of food and games. 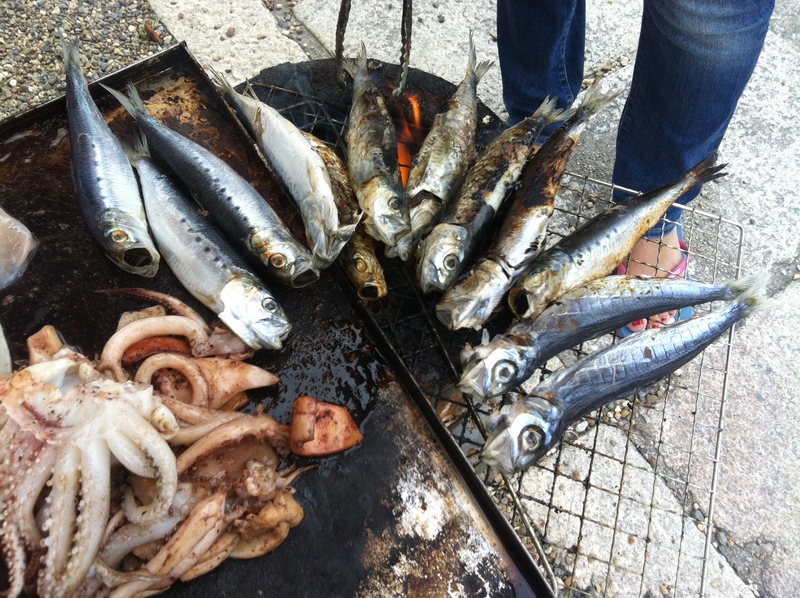 Tisya fried her own fish for lunch! 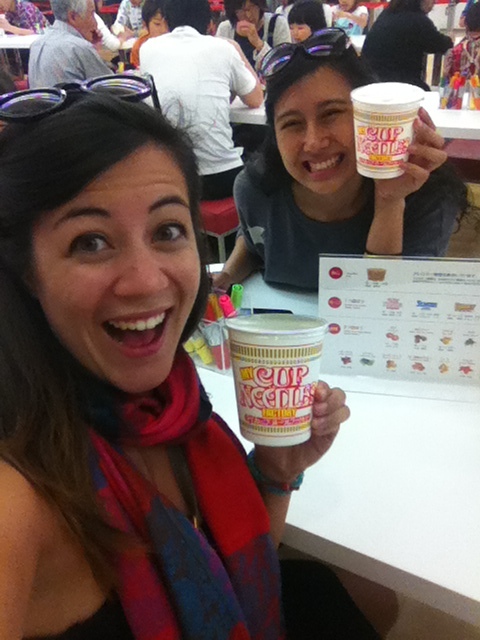 I just had must do during my time in Osaka: The Instant Ramen Noodle Museum. This sounded like my kind of museum considering it’s pretty much my main food source!!! But what I did not realise is that I would stumble upon the world’s most ideal first date scenario. You arrive in the museum and you are guided go to a room where you pay 300 yen (1 pound 60 – bargain!!!) 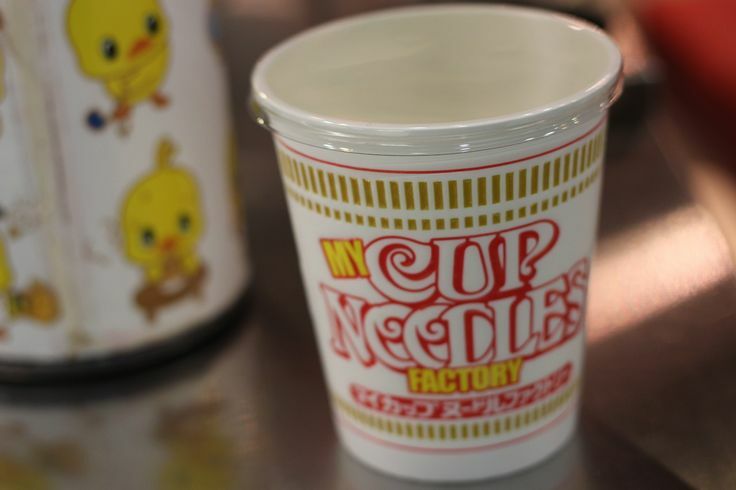 to make your very own instant ramen noodle pot. What more could you want out of a museum?? Often when you meet for a date you meet for food, which is great, but, eating in front of somebody is fine, but you can’t exactly speak freely when you are a) Hungry and b) stuffing your face with food. 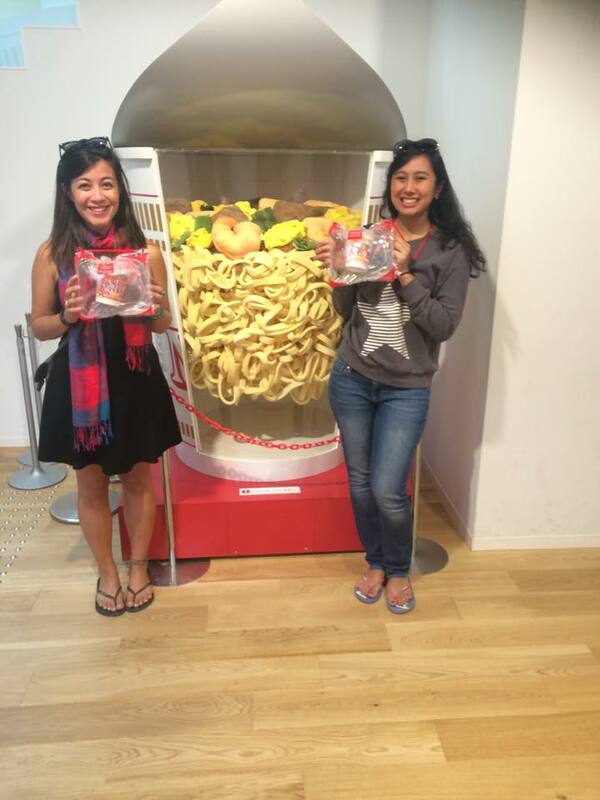 At the Museum of Instant Ramen Noodles you come together to experience food in a personal way. When choosing your flavour and ingredients of noodles, you have the opportunity to learn about the other persons likes and dislikes when it comes to food/noodles. Very important when it comes to choosing a life partner. Then, if you enjoyed your date, leave the museum, find a nice spot in the city, find some boiling water and sit and eat together. Wonderful. Bags you pumped with air (and a necessary picture with a human sized ramen noodle pot)! After this we went to Shinsekai to find some food. Tisya and her boyfriend took me to eat ‘Kishukatsu’ which is famous in Osaka. It is basically dipping deep fried food into a special sauce – it is so delicious and there is so much to choose from. There was deep fried cheese, an assortment of meats and vegetables and I even tried cabbage and liked it. Success!! We ended our meal with a shot of Saki. It definitely makes a diffirence being shown around by people who live in a city to places, I’d never have discovered this place. 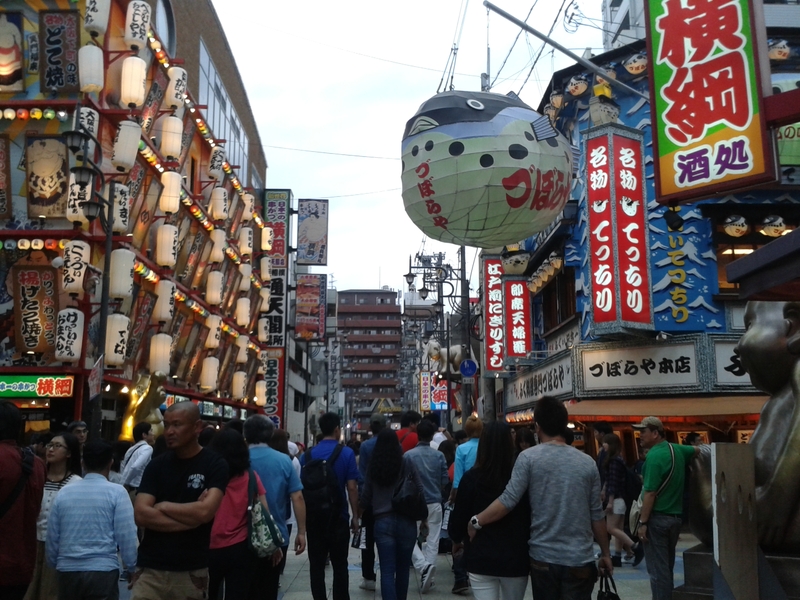 Dōtonbori is one of the principal tourist destinations in Osaka. This area runs along the Dōtonbori canal from Dōtonboribashi Bridge. Most tourist (including myself) have their photo taken here with the Glico advert (the running man in the picture and a perminant fixture). However he does get altered every now and then to celebrate events. 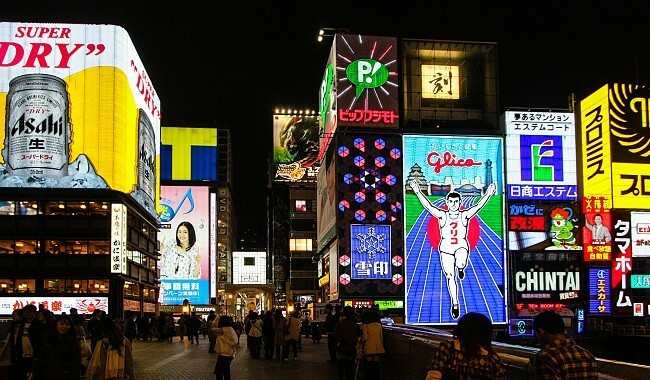 But it seems like no one knows why the Glico man is so popular. Thank you for sharing your fantastic trip.